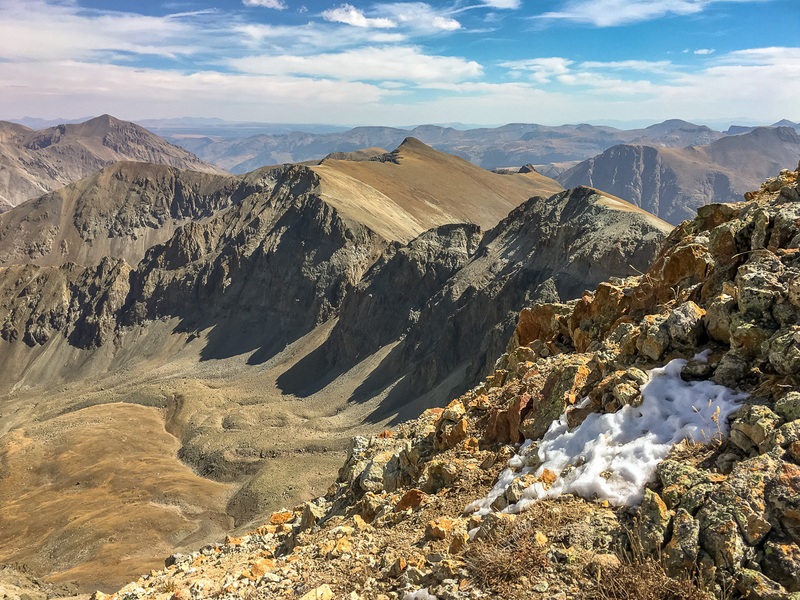 The summer was nearly over and I still hadn’t climbed any 14ers, so I set out to rectify the situation with a trip to the San Juan Mountains of Southwest Colorado. 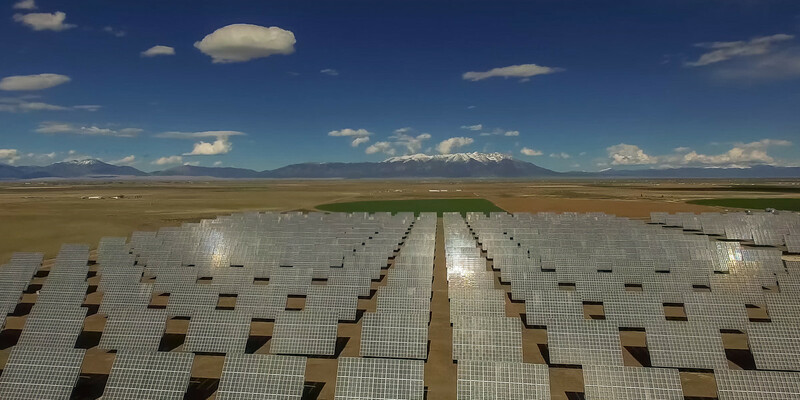 The San Juans—Colorado’s biggest and wildest range—are home to more than a dozen mountains above 14,000 feet. 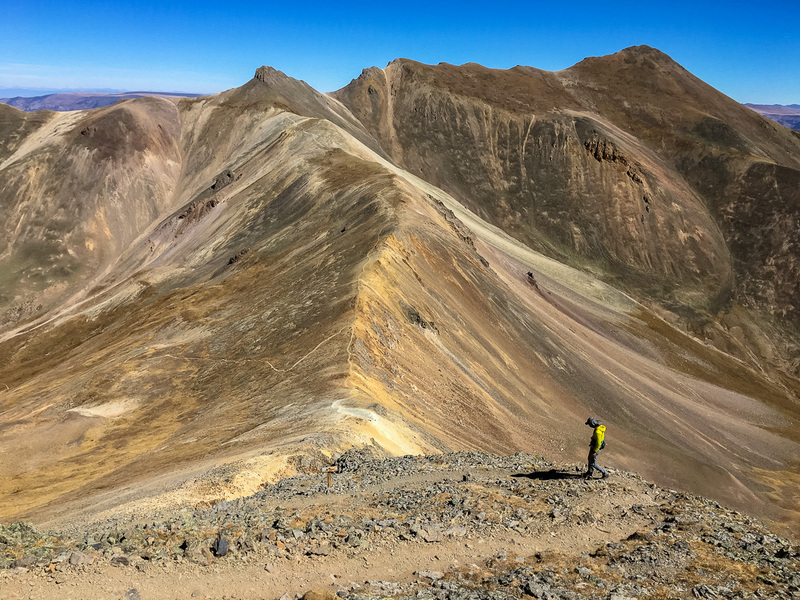 We try to hit the area at least once a year, but the San Juans are a long drive from Denver, so after 10 years of living in Colorado, I still hadn’t climbed any of the range’s tallest peaks. With Ginette and Camille visiting friends in Seattle, I took a solo journey with plans to summit three 14ers over two days. On the drive out, I passed by Blue Mesa Reservoir, Colorado’s largest (manmade) lake. 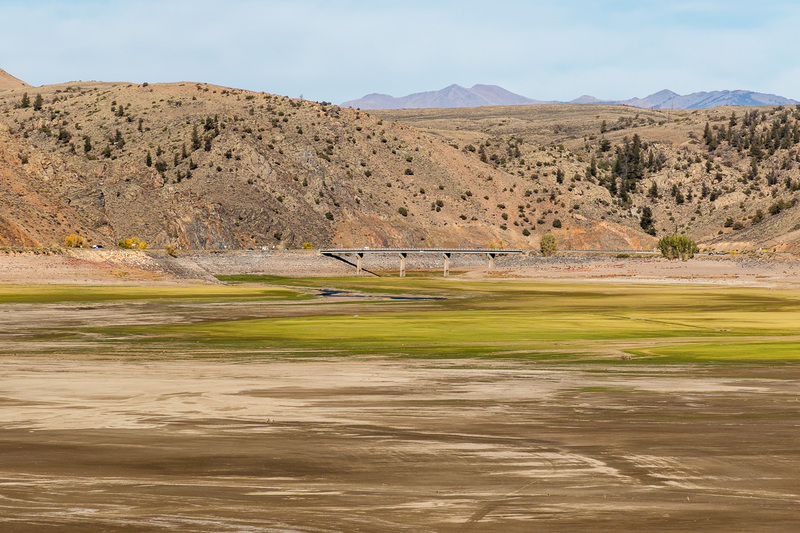 Central Colorado has been in a drought, so the reservoir has shriveled. In the photo below, the stream of water coming into the reservoir is the Gunnison River, a tributary of the Colorado River. After a few more hours of driving, I camped near the Grizzly Gulch trailhead, which would be my launching spot for both of the hikes. Had I been visiting in the middle of summer, I imagine the place would’ve been crowded, but I was there in September and mid-week, so I was happy to find plenty of camping spots and solitude. I arrived early enough to see the setting sun illuminate the next day’s objectives. 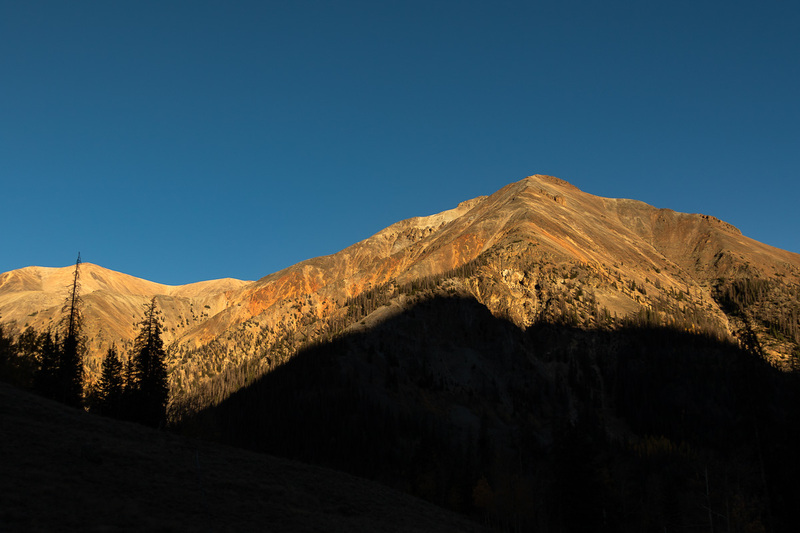 The photo below shows Redcloud Peak (14,034 ft.) to the left and Sunshine Peak (14,001 ft.) on the right. After the sun went down, I set up the tripod for some quick astrophotography before the moon rose. 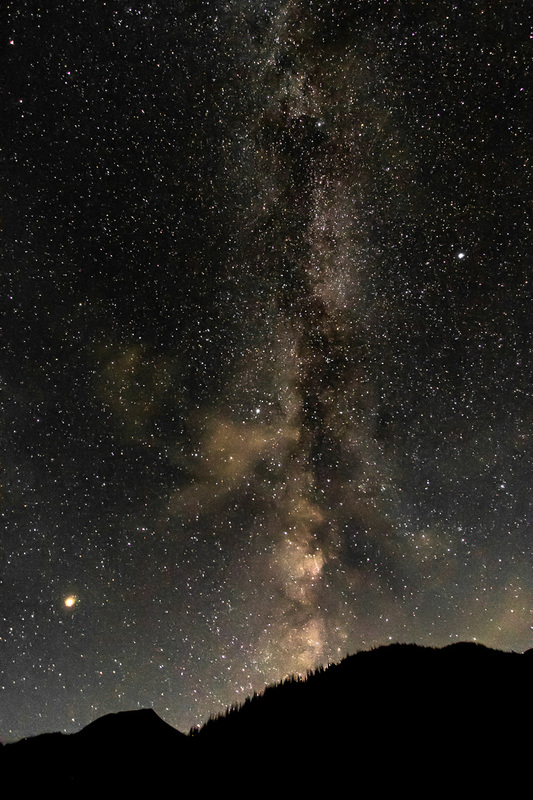 I only had about an hour with truly dark skies, but the view still impressive. Not much light pollution in the neighborhood! I figured my night of photography was over when the moon started peeking above the horizon. 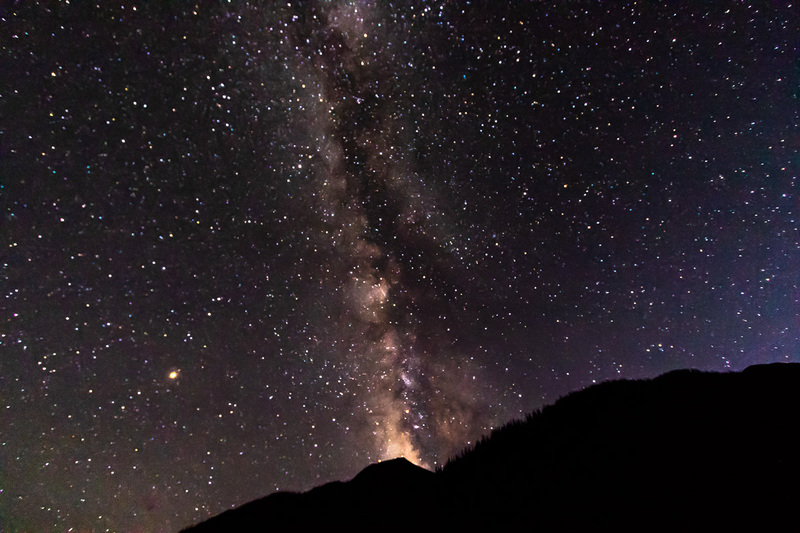 But I soon realized that I could capture the moonlight illuminating the surrounding peaks while the sky was still dark enough to reveal the stars. The photo below illustrates this lunar alpenglow. The next morning, I woke around sunrise and quickly made breakfast so I could begin what promised to be an epic day of hiking. My campsite was about a half-mile from the trailhead, and as I embarked on the journey in the early morning light, I wondered if I’d be back before dark. 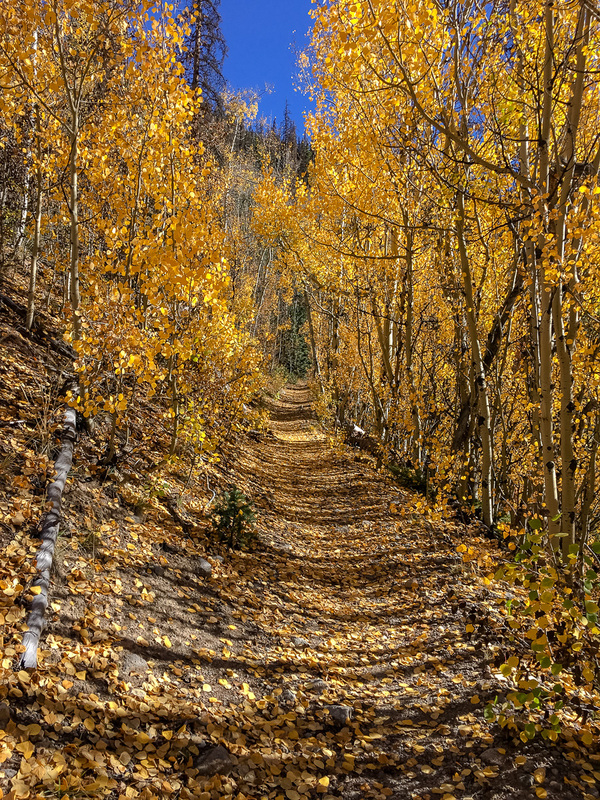 The trail began with a lovely stroll through an aspen grove with the leaves peaking. I could’ve spent a lot more time photographing the area, but I knew I had better get a move on. The weather was perfect for climbing a 14er. There was zero chance of rain and thunderstorms, so I didn’t have to worry about being stuck up on some ridge while Mother Nature was hurling down lightning bolts hotter than the sun. In fact, I didn’t see a cloud in the sky the whole day. After a mile or two, I’d gained some elevation. I shot the photo below while looking back at the trailhead. The peak on the far left is Handies—my goal for the next day. The trail to the top of Redcloud was straightforward and totally nontechnical, so I was able to make good time. 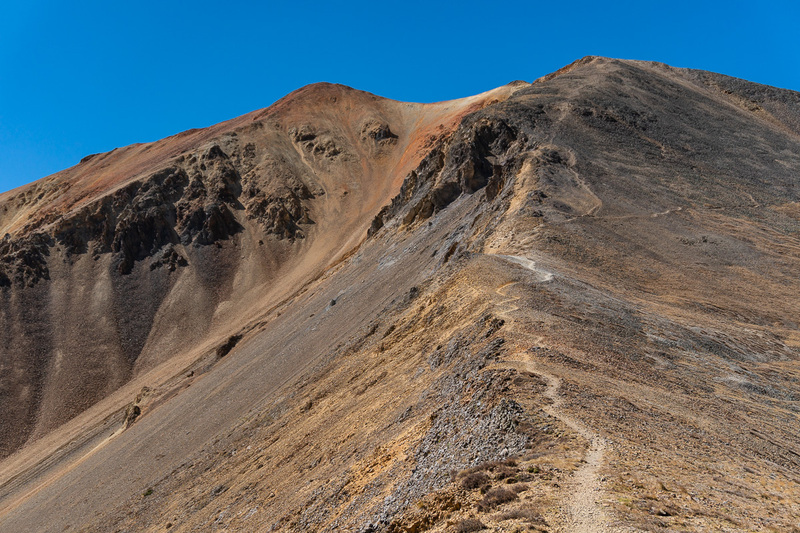 As is common with 14ers, the approach was relatively tame, but the last few miles got super steep just as the altitude was starting to take a toll on my body. 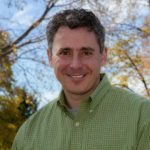 I’ve lived in the mile-high city of Denver for a decade, but that doesn’t spare me from the ill effects of oxygen deprivation while hiking in Colorado’s high country. I feel shortness of breath when I’m just a few thousand feet higher than Denver in the foothills of the Rockies. Above 12,000 feet, I really notice the difference and start feeling the familiar fatigue, fuzzy thinking, and queasiness in my gut. 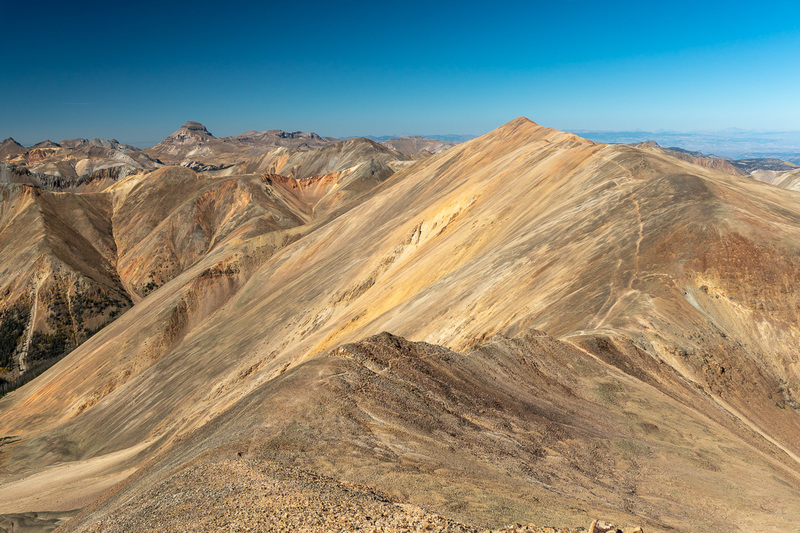 Below is a panoramic view from near the summit of Redcloud, looking north. 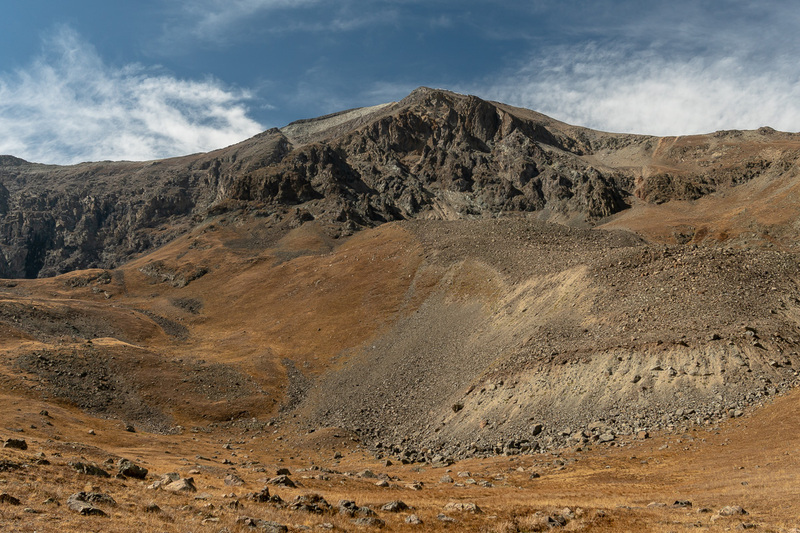 Toward the end of 14er climbs, I slow down to a crawl—sometimes well below 1 mph—and I wind up making lots of pit stops, so there’s no shortage of opportunities to take photos. When I reached the top of Redcloud, I had the summit to myself. I was surprised at how red the rocks were. I could imagine that around sunrise and sunset, the light bouncing off the red summit would illuminate the clouds above in a display befitting the peak’s name. I was feeling spent by the time I reached Redcloud’s summit. Looking south, I could see that I still had a formidable hike ahead of me to reach neighboring Sunshine Peak. 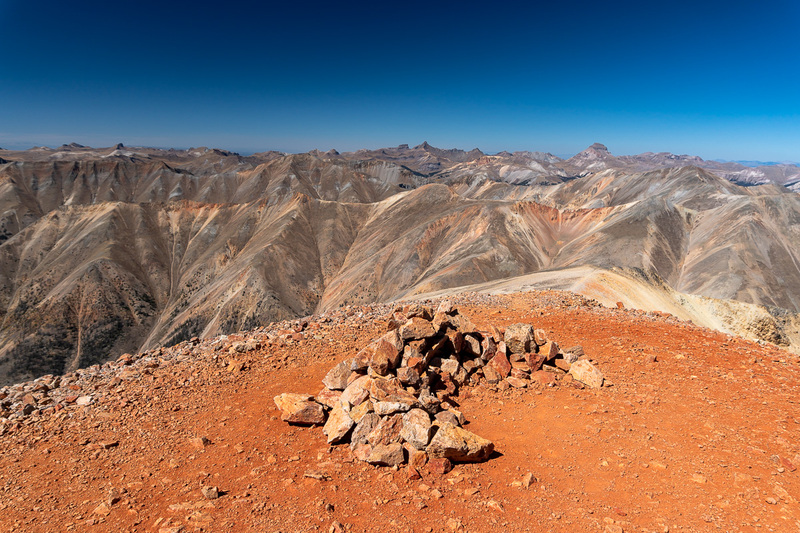 At 14,001, Sunshine Peak is the shortest of Colorado’s 14ers. If it were two feet shorter, it would see just a fraction of the visitation. 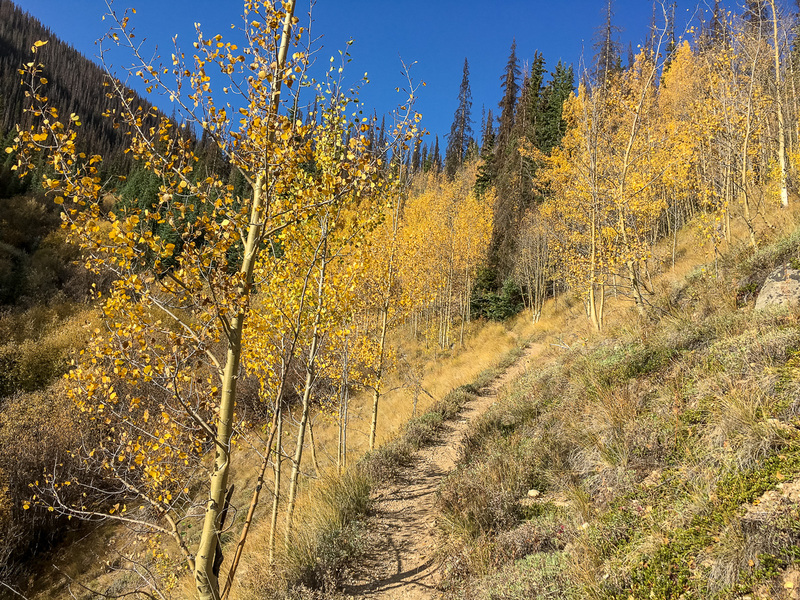 The trail from Redcloud to Sunshine looked well-defined and not too steep. By now I was well above 14,000 feet, and I’d been at high altitude for hours, so any activity felt strenuous. 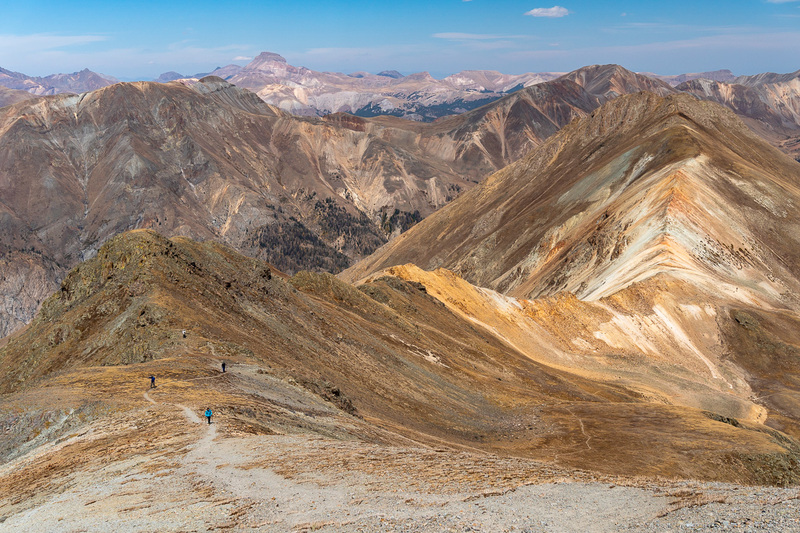 The photo below, from the top of Sunshine, looks back on the route from Redcloud, which required dipping down around 500 feet, then regaining that lost altitude, and then doing it all over again in reverse on the way out. 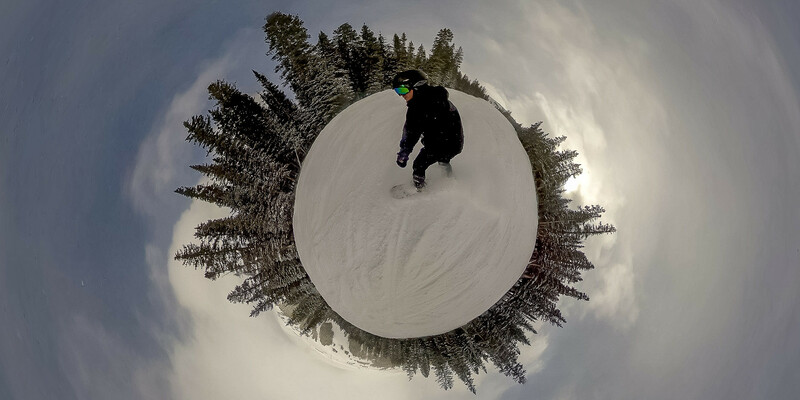 I didn’t see a soul on the way down the mountain, and I’d only seen five or six people on the way up. I was exhausted, but it felt exhilarating to bag two 14ers in one day and spend so much time staring at such stunning scenery. 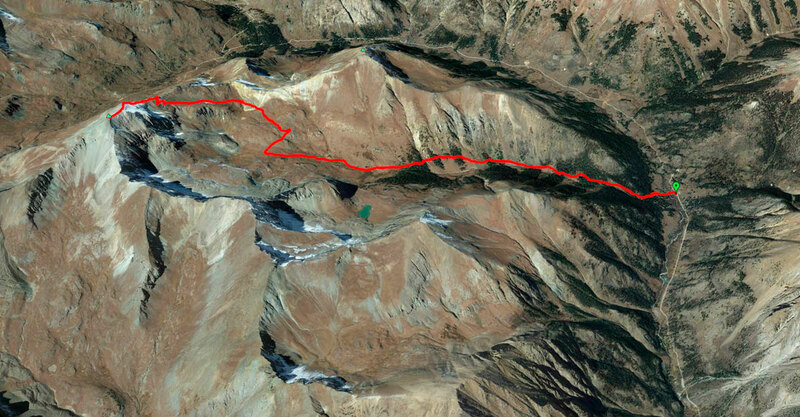 The map below shows the day’s hike, which my GPS tracker put at about 13 miles round-trip. More than a mile from the trailhead, it was already dark enough to demand a headlamp. On the other side of the valley, I could see a flickering light: another hiker, just like me, who was coming down the trail to Handies, my goal for the next day. Judging by the light’s position—close to the trailhead but dramatically higher in elevation—I could tell that tomorrow’s hike would have an abrupt start. Back at camp, I wolfed down a carton of mac and cheese with a packet of tuna mixed in, washing it down with some beers and a few Nalgenes of water. My appetite was voracious, so I also gobbled down a Toblerone chocolate bar and some cookies. I’m sure I burned more calories than I consumed on this day. With another long hike ahead of me, it didn’t take long for me to retreat into my tent. But I couldn’t resist staying up to shoot a few more images of the night sky, which was just as brilliant as the night before. The next morning, I woke up in my sleeping bag and immediately smelled smoke. I sank lower into my sleeping bag, knowing that wildfire smoke had made its way to me. When I turned on the car, the dashboard said it was 29 degrees, so I was justified in feeling chilly as I made coffee and oatmeal. 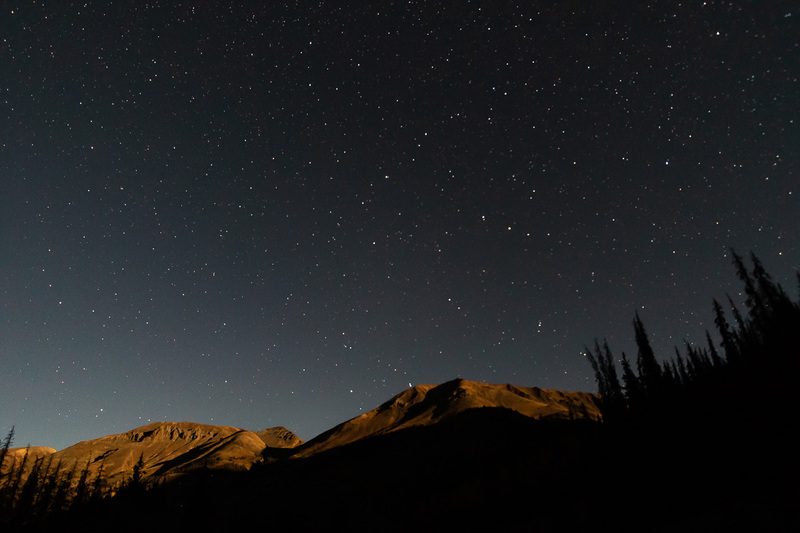 The sky was cloudless, but even from my campsite I could see the haze between me and the mountains a mile or two away. With legs sore from yesterday’s hike, and fearing for my lungs, I set out to summit Handies. The trail immediately spiked upward and had me puffing and sweating. Fortunately, and much to my surprise, the smoke lifted as the morning wore on and the wind picked up. You could still see a little haze, but it no longer smelled like a campfire and my bronchial tubes weren’t burning as much. 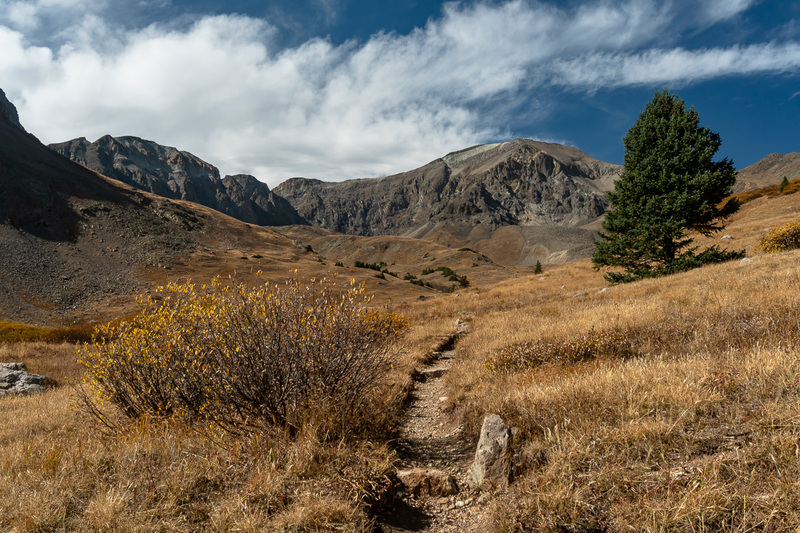 Handies is considered one of the easier 14ers, especially if you take the standard six-mile route from the American Basin trailhead. 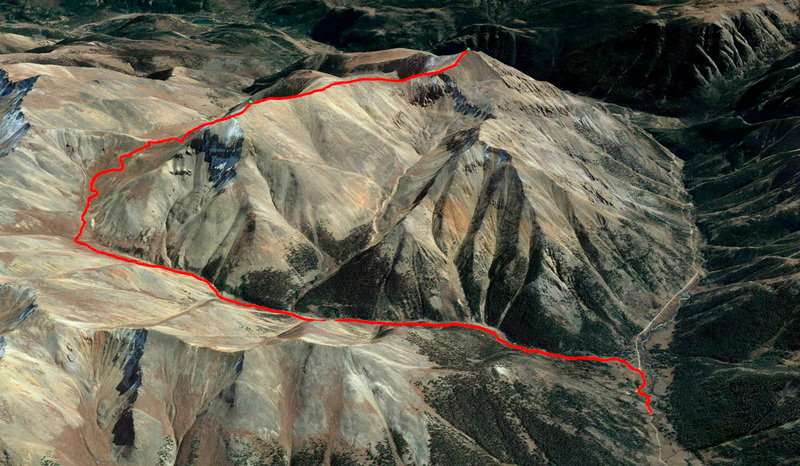 That route only gains about 2,500 feet, but the trail I was a few miles longer and would rise around 3,650 feet. After a steep start, the trail leveled out. Emerging from the forest at treeline, Handies was dead ahead and unmistakable as the destination. One of the many amazing things about climbing mountains in Colorado is observing the impressive aftermath of immense geologic forces at work. In the photo below, you can see that erosion and gravity have done a number on the terrain, but the boulders in the foreground couldn’t have made it there just by falling and rolling: I think glacial action also helped scatter the debris. The mild trail quickly turned steep again in order to gain the ridge that would dominate the rest of the climb to Handies. 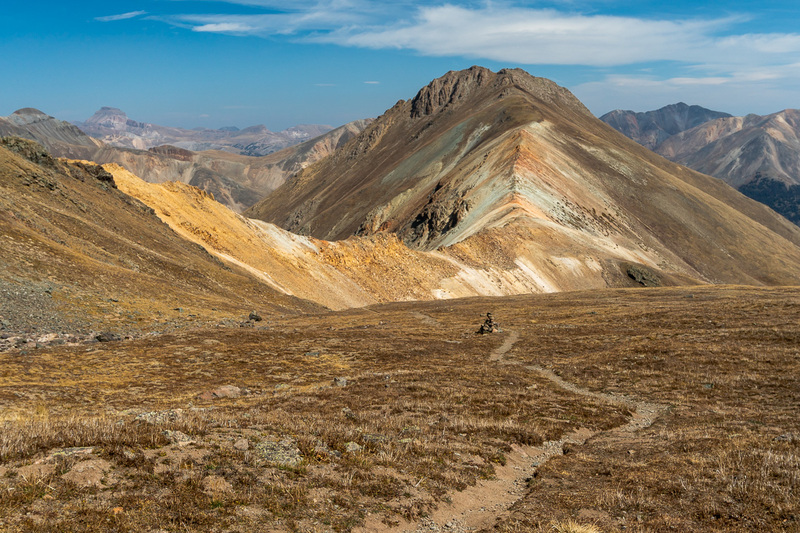 The photo below looks back on the trail and Whitecross Mountain, a 13er whose white and yellow rocks were luminous in the sunlight. Near the top of the ridge, I saw one of the few people I would meet the whole day. This guy was jogging down the trail and didn’t have a pack. 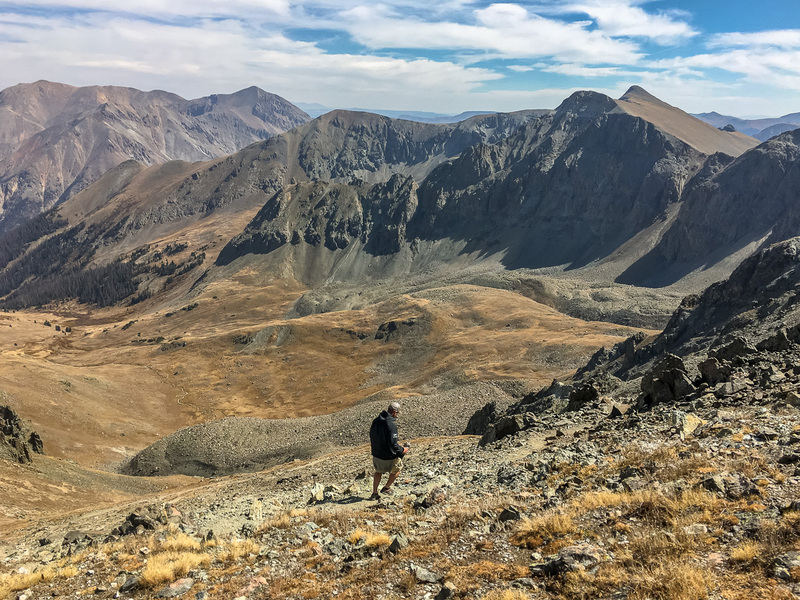 I take 100+ ounces of water on 14er hikes, as well as food, extra clothing, a first aid kit, and other supplies in a large daypack, so I’m not sure how these minimalists do it. Near the top of the mountain, I saw evidence of the season’s first snow. There wasn’t much left, but seeing the white patch got me excited and thinking about how ski season was right around the corner. 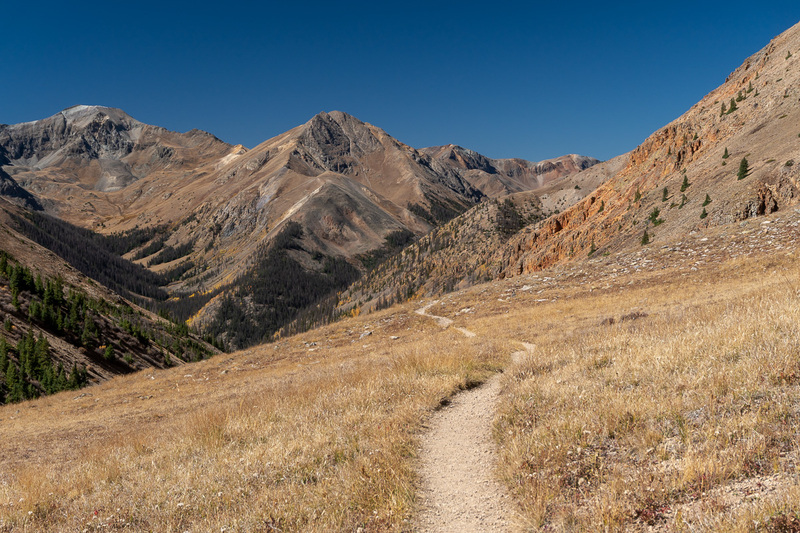 The final stretch of the trail ascended along a granular ridgeline that offered expansive views of the northern San Juans. 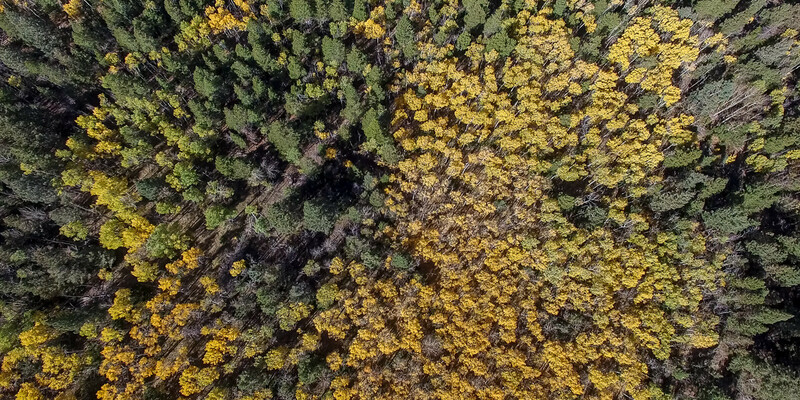 Many other Colorado mountain ranges are linear and relatively narrow, but the San Juans are sprawling and cover more than 4,000 square miles. I shot the photo below shortly before reaching the summit. From the top of Handies, the view was wild: mountains beyond mountains in every direction. I could see a number of other San Juan 14ers that are on my bucket list, especially Wetterhorn and Uncompahgre. Compared to the day before, the visibility atop Handies was slightly reduced by the wildfire smoke, but it was a lot better than I was expecting when I started the hike. The map below shows the route, which my GPS estimated at nearly 9 miles round-trip. 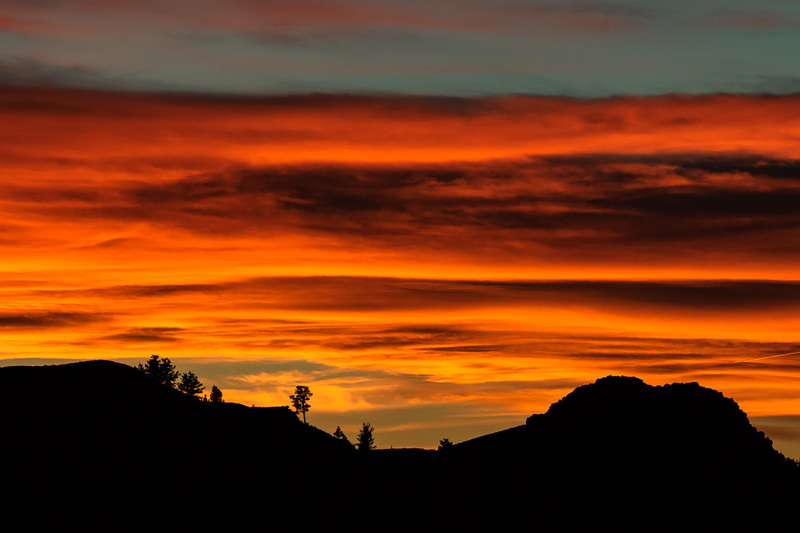 Driving toward Monarch Pass, I noticed a fiery sunset in the rearview mirror and jumped out of the car for a few more photos. I suspect the wildfire smoke was enhancing the atmospherics. It was a stirring ending to another amazing day in the Colorado high country. For me, the sun has set on this year’s exploration of 14ers, now that snow is burying Colorado’s tallest peaks. I’m psyched to have crossed the halfway point—Handies was my 27th summit of Colorado’s 53 14ers—and I’m looking forward to making more progress next year.